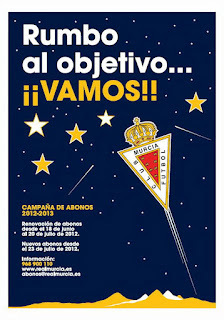 Acho....The one and only Real Murcia....Pijo! : On course? A football club isn’t like a house or a car. It isn’t even like any other type of business. A house or a car has an owner, people may like yours, you may like someone else’s, but there are no emotional attachments or obligations of custodianship on the behalf of others with an interest in them. Businesses make products or services and sell them, and success, in simple terms, is to produce your product or service and be able to sell it for a price and in a quantity that allow you to turn a profit. That means your product has qualities that attract customers to pay the asking price that makes the business a living. Shareholders in a business want their investment to multiply. There are few “details” such as a refereeing decision going your way or a gust of wind diverting a goal-bound shot wide. In business everyone can win, something of impossibility in football. Owning a football club is altogether different. You may have shareholders to satisfy, but you also have the weight of custodianship to carry. The club may be your plaything, but you are only really a baton holder, carrying the clubs honour, heritage and well-being forward, until passing the responsibility on to another with similar intentions. That’s the ideal, but the reality is all too often very different. Recently owners have used clubs for self publicity, as a key for political gain, as a vehicle to other bigger business, and worst of all for pure and simple money laundering. Of course in football there are zero guarantees of success. There is bad luck, loss of form, referees and other details that decide your fate. But if your owner works to a plan, reduces the risk of bad luck and does his upmost to ensure a fair deal from the referees, you have more chance of those “details” going your way. So why do Real Murcia seem to be on the wrong end of so much? Why does our owner inspire such negativity from the fans? Chairman Jesús Samper (Madrid, 1950) is very well known in Spanish football, a former president of the Liga, he purchased the club in 1998 in Segunda B and with a very shaky and uncertain future. No local businessmen had come forward in the moment of need. He has overseen the move from the decrepit but beloved La Condomina to the plush surroundings of the Nueva Condomina (a new stadium had been talked about for decades but never achieved). On the field our record under him hasn’t been great; just 2 seasons of top flight football (both ending in early relegation) and many campaigns of mediocre fair in Segunda, and even another dip into Segunda B in season 10-11. Despite people’s misgivings, he’s still here. But suspicions of his motives are abundant, his other business interests in the region seemingly unattached to Real Murcia but that benefit from the name and from the fact that the town’s club are a “hot potato” for our politicians and is therefore seen as in safe hands with Samper. Club ownership has equalled political favour. Other business interests also seem to benefit where Real Murcia don’t. The perception is that meetings are in Madrid, and that the management of the club is far from top priority, and that there is little emotional attachment or feeling for the club. The question of how such a successful businessman can have such an average record whilst in ownership of the club (a record, let’s not forget, is no better or worse than that of this various predecessors) is often asked. Personally I don’t doubt his desire to make Real Murcia successful. However the methods are clearly not producing. I’m not saying that we should have expected immediate promotion to Primera after coming up from Segunda B. I’m saying that for the last 5 seasons we have either flirted with relegation to Segunda B or been in Segunda B. Now anyone can have a bad season – but to be continually in danger stinks of mismanagement. As the Peñistas so succinctly put it, ”Años sin rumbo” (Years without direction). When you look at the make-up of the board, it’s not hard to see why. Nepotism (3 other Samper family members) and yes men, token locals and one fan representative. I can remember a case where the locals weren’t even invited to a board meeting. I can’t imagine a business with years of underachievement not having a shake-up; indeed would Mr. Samper accept such poor performance from another of his businesses without a change in management? Or the addition of a non-executive post so useful for asking difficult pointed questions and to query decisions? I’m sure the young Sampers’ on the board (J.A. Samper de Miguel and Gonzalo Samper de Miguel) are nice capable and Madridista lads, but are they going to query anything or spend time and effort on Real Murcia? I hope I’m wrong, but I very much doubt it. Then there is the almost total reluctance from within the club to say a word in criticism of referees – and let’s face it, time and again we are on the wrong end. What is the problem? Could we get even worse treatment? I would love to see Samper thump a table, show some emotion and stick up for his club. Earns brownie points with the fans too. And maybe, just maybe, your referee will think twice about awarding that dodgy penalty against us or refusing that stick on pen for us. It won’t hurt to try. Weeks have passed since our last game. From the outside it seems nothing has changed. Inside they may have already decided on the future of coach Iñaki Alonso, but they are not letting on. Despite Jesús Samper’s assertion that the “minimum requirement” for the 12/13 season would be to reach the play-off, I can see no reason to think 12/13 will be any different from the 5 previous seasons. The bulk of the squad will continue. There may be no change in the manager. Money is tight. It could be that the stars align, but I can’t see how we can go from a lower points score from that obtained when being relegated in 9/10 to suddenly being a top side in the division. In my business we say that quality and success are the result of a series of good decisions made over a long period of time, and are no fluke. Real Murcia still has no decent training facilities so central to bringing young talent through the system. Talent that costs little, has emotional ties to the club, and ultimately either contributes to the club with performance or transfer money incoming. The campaign poster for 12/13 season tickets seems to be a case in point for how not to do things. After a poor season, using the same word (“Rumbo” – meaning course or direction) as the fans used to clearly criticize the way the club is being run is rather strange. Or crass. Or dumb. The design is amateur; the look is Christmas (what are the mountains about?). What is the thinking? Is the “rumbo” to follow a star and find Jesús? (no pun intended). I also don’t get the thought process or economic reason behind the “Grada Joven” (Young stand). The idea is great; give under 25’s a cheap option and a place to gather. The lateral has been almost empty since the stadium opened. Clearly overpriced is another way to describe it. I can see why they decided to put the “Grada Joven” there with a 40% discount on normal price. However this still makes it more expensive than other sectors of the ground. Do they think under 25’s will be willing to pay more for a better view? Or do they expect a flush of new customers to come in? Either way they evidently haven’t though it through very well, and I feel it’s doomed to fail. I know now is an easy time to be critical. But I’ll be behind the team come what may. I’m just frustrated by the clubs current custodians’ management. It needs time and effort....a plan.....and right now I don't think we really have one.